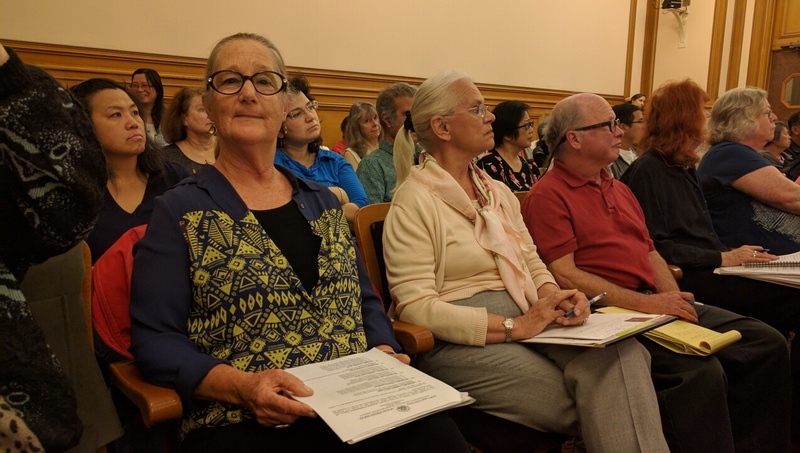 Some 60 people came to address a Friday morning hearing on proposed changes to the L-Taraval. Photo: Streetsblog. 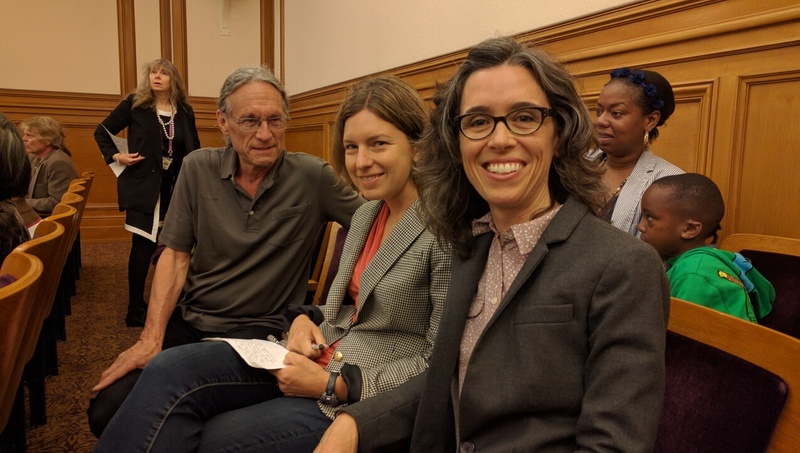 SFMTA, at long last, held its final hearing on the proposed Muni Forward safety and speed improvements to the L-Taraval. The two-hour meeting, which started at 10 a.m. at City Hall, was attended by some 60 people. 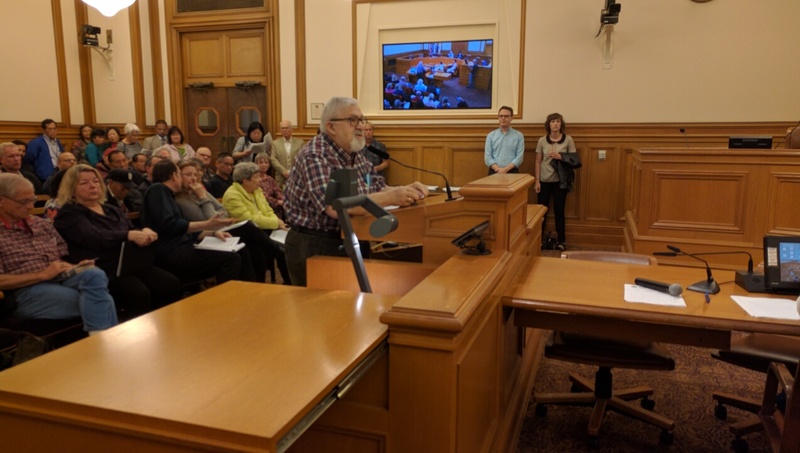 Streetsblog readers will recall the last large hearing for Taraval was held in February and, as with many of these big public hearings, there were outbursts, groans, and grumbles. Rhodes reviewed the project with a somewhat unruly audience. Photo: Streetsblog. Rhodes (yes, the previous Streetsblog guy) was effective in outlining the situation: 46 pedestrian and vehicle collisions reported in the past five years. As Streetsblog readers will recall, Taraval is one of the most dangerous streets in San Francisco for pedestrians, in large part because it is the last remaining business corridor with streetcars but no boarding islands: 22 of those pedestrian collisions happened as people were getting off and on trains. Concrete boarding islands eliminate that danger. 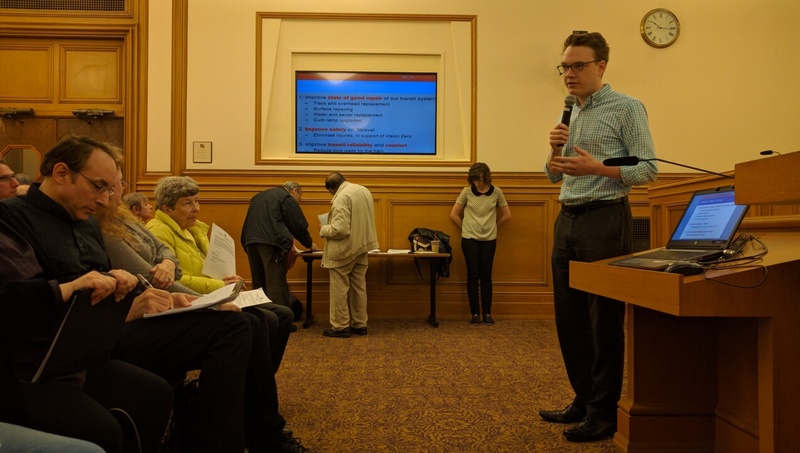 Peter Strauss from the San Francisco Transit Riders, Laura Tam, a Sunset District resident who is also with SPUR, and Cathy DeLuca with Walk SF were at the meeting. Photo: Streetsblog. 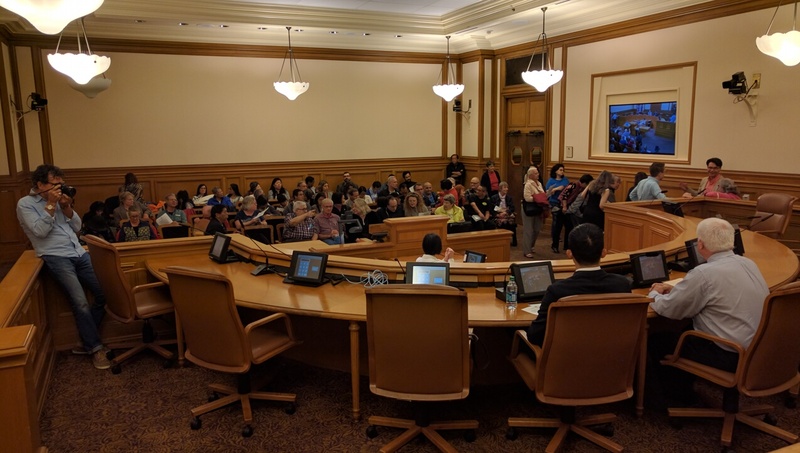 Streetsblog readers will recall that SFMTA plans to use five of the least-used stops on Taraval to try some alternate safety measures to concrete boarding islands, such as painted boarding areas. But removing any boarding islands from the plan does not sit well with livable streets advocates. “Boarding islands are also called ‘safety islands’ for a reason,” said Peter Strauss, a member of the Board of the San Francisco Transit Riders. Once Rhodes finished his presentation, which took about 15 minutes, the speakers started lining up. Roughly two-thirds were opposed to the changes, which include some stop eliminations, banning through automobile traffic from driving on the tracks, pedestrian bulb outs at corners, removing street parking, sidewalk widening, some additional traffic lights, and, as mentioned, adding concrete boarding islands at most stops. Salomone said something else that, in one version or another, came up frequently in the comments. “Part of the problem with accidents [people getting hit as they step off the train] is Muni riders not taking their responsibility. When I was out there I had responsibility. I looked before I stepped out!” he said. Guido Salomone blamed Muni riders themselves for the injuries on Taraval. Photo: Streetsblog. That sentiment seems misplaced, since it is illegal for a car to pass a stopped streetcar discharging passengers. “Who knew stepping off the L train is one of the most dangerous things riders do every day?” said Julia Fox, another nearby resident. “I witnessed a young woman bounce off the hood of a car. But even I forget. Just Wednesday, I was about to step off on 35th and I was almost hit by a car blasting past. My primal scream…saved other riders. I strongly support the boarding islands,” she said. Julia Fox, front left, wants concrete boarding islands at every stop. Photo: Streetsblog. A date for a final vote has not been set, but SFMTA says it will come in September, at the earliest. 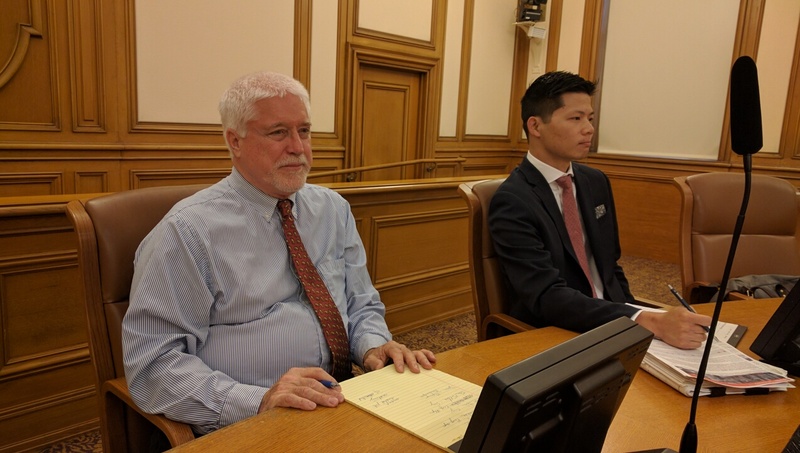 Mike Hanrahan and Robert Lim took comment at the SFMTA’s final hearing on the Muni Forward L-Taraval changes. Photo: Streetsblog. When did you read “80% of voters own a car”? I thought it was 70% of *households* (not individuals) which have a car. Both are true. About 70% of SF households have at least one car. About a third of those households own two or more cars. The total number of vehicles registered in SF is about the same as the total population. Since many SF residents are not citizens and cannot vote, and are probably poorer on average and less likely to afford a car, the number for voters who live in a household with at least one car is probably close to 80%. And even if you don’t own that car, if it is in your household you probably benefit from it from time to time. Not 100% of them may vote that way all the time, but denying it’s a factor seems naive. However, legally, they are not liable: drivers are, because they’re the ones actually breaking traffic laws and putting others at risk. Uh, transit riders also make two dimensional trips: for example, I transfer to the 28 at 19th Ave.
Just because one road user is breaking a law does not automatically mean that they are 100% to blame for any accident. For instance, if I am parked in a bike lane then that is against the law. But if you are riding your bike in that lane, fail to see me, and as a result hit me, you’d be at fault. It’s just that your blame would be mitigated. In many accidents, both parties are at fault, and I’d say that applies when a pedestrian walks out into the street and is hit by a vehicle that should not have been there. There’s a big difference between parking in a bike lane and hitting someone while committing a moving violation. Maybe so but the fact remains that just because the other party to an accident was infringing some law does not, in and of itself, mean that the other party is blameless. You cannot act as if you have immunity from common sense and reason just because the other did is in the wrong. As an example, when crossing the street, I always loo both ways even if it is a one-way street. Nor do I assume that all cars are obeying the speed limit nor that every cyclist will stop at a stop sign. True but it’s a lot more ponderous to that on the west-side of town, so I’d guess that the percentage of such journeys done by car is greater. Sure, there are some collisions in which both parties bear some responsibility. But conversely, just because you could have possibly been more careful doesn’t mean that you actually bear any *legal* liability, especially if the other party only hit you as a consequence of violating a traffic law. For example, it’s good to look both ways before crossing even if you are at a crosswalk and have a green light. But legally, if you only look forward and are hit by a driver who fails to yield, you are still not responsible for the accident. Typically, Taraval is not particularly congested from 1-5 AM, so I really doubt an extra lane would make a huge difference. It’s certainly possible that even more people would make two-dimensional trips by transit if service along the L were faster and more reliable. That’s part of why the proposed changes (which include stop thinning and a transit-only lane pilot) are important. But even as things stand now, I’m very skeptical of the argument that cars make way more two-dimensional trips than transit users. The 28 is one of the highest-frequency bus lines in Muni’s system, scheduled for ~10m headways during the day, and is usually full near rush hour; the L also intersects with the 29, 66, and 18. And obviously, a significant proportion of the people who take the L will then walk several blocks north/south. More broadly, the L isn’t just “for” people who live right on or near Taraval. You seem to be laboring under that misconception in a lot of your comments, like when you say that the L only serves a tiny portion of the Sunset. For people who depend on transit, the L not only connects the Sunset to points east and BART, it’s also an essential part of a grid of trains and buses serving the whole area (with the N, 7, 48, and L going east-west, and the 28, 29, 66, and 18 going north-south). In that case the car was traveling the same direction as the pedestrian, but turned left into the crosswalk and hit them. They make clear that the pedestrian had the right of way and therefore was not negligent. Here’s the code: 21456– A pedestrian facing the signal may proceed across the roadway in the direction of the signal, but shall yield the right-of-way to vehicles lawfully within the intersection at the time that signal is first shown. Sure, in that case they would probably be jointly at fault. But as that code mentions, it applies to cars that are lawfully in the intersection; as I understand it, the bar for contributory negligence would therefore be different if the car wasn’t supposed to be there in the first place, e.g., because the driver was coming the wrong way down a one-way street or making an illegal U-turn or something. Since nobody actually brought this up, he didn’t actually discount or ignore speakers because they were old: his point was that the meeting attendees were a highly non-representative sample of the neighborhood population. Transit is the circulatory system of the city. The *whole* city, not each fiefhood. Worth it because more people won’t lose their lives and/or mobility.